For most marketers, open rate is one of the most important metrics. But why is this the case? And how is open rate mesured? Are high deviations between the different ISPs (e.g. Yahoo, Hotmail) a reason to worry? In December 2013, GMail announced an interesting update: Image Caching was introduced. Per default, images should be displayed (instead of suppressed as before). For security reasons, images should be scanned for malware , therefore caching was a necessary measure to be taken. 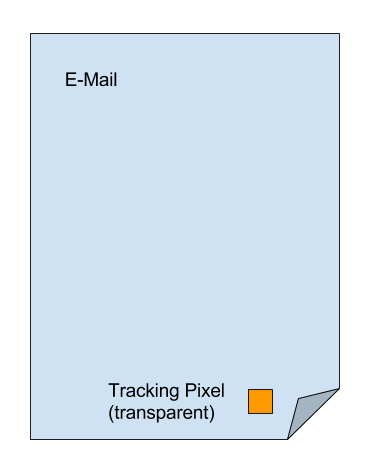 A tracking pixel is a transparent image of 1×1 pixel size. With it’s help, openings and META-data like geo-location can be tracked. With this change, consequences for marketers are not limited to the default display of images. Most ESPs are measuring open rates with so-called “tracking pixel”, a transparent picture of dimension 1×1 which is located in the newsletter. By requesting this image from the server, opening of the e-mail can be tracked. This request does only takes place once with caching, repeated openings display images from the cache. This means we can only track “unique opens” (how many users have clicked at least once) anymore, the information of “absolute opens” (how open the mail was opened in total) can’t be measured anymore. 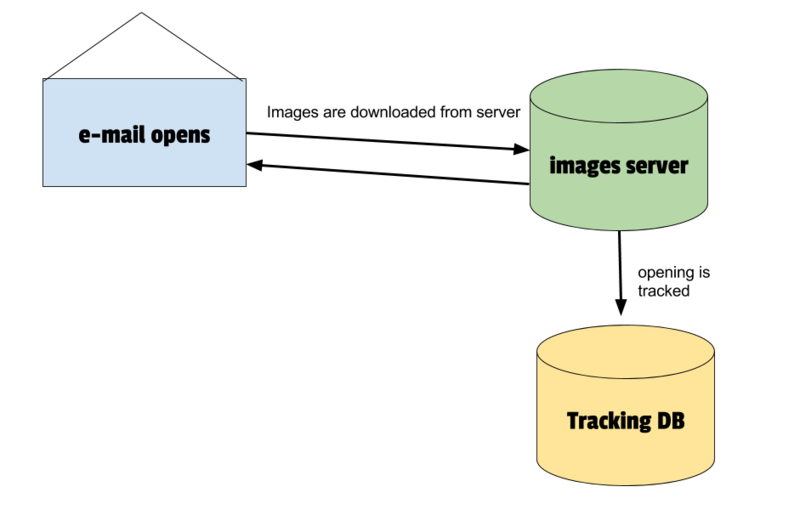 Images including tracking pixel are requested from images-server. Opening will be tracked. Another option that can’t be done anymore is the later replacement of images with other content (e.g. to update an offer after a specific time). With the “old” method, marketer could influence the images for later openings, but with caching, the option has gone. In addition, tracking information of Geologation or used devices can’t be tracked anymore. All images are requested from the caching server with Geolocation somewhere in the US. Providing device-specific images is not possible with Caching as well. Sounds like caching brings some disadvantages? True, but there’s also some positive effects. 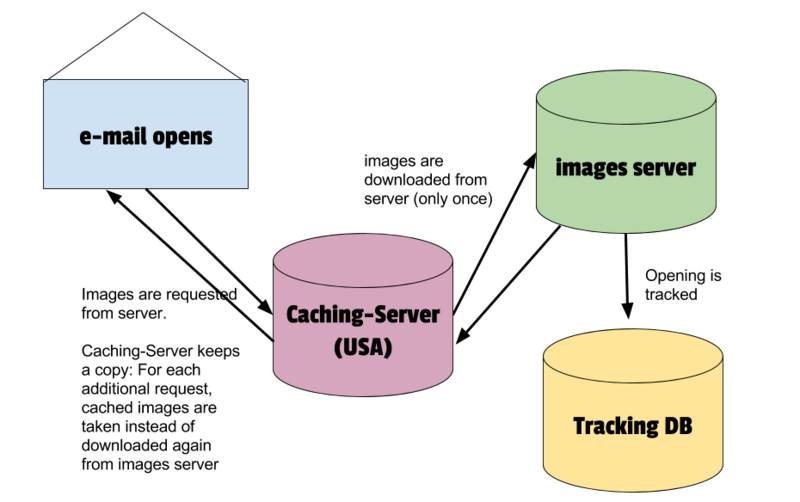 With caching, each opening will be really tracked – not only if the recipient expicitely allows displaying images. What’s behind divergent open rates? Reasond for deviation lie in different handling of accepted mails between the different ISPs. Spam delivery can be identified easily – with an open rate of 2% or below you can be quite sure, that mails are not reaching the recipients inbox. Is open rate at – let’s say 14% and with another ISP at 8% you can calm down – e-mails are delivered into the inbox for both ISPs. While some ISPs suppress images by default, some others display them – and some even use caching and request the tracking pixel on each open with that method. And last but not least: Also the choice of ISPs is a question of generation or target group. Different generations prefer different ISPs – and as a consequence, populations are not comparable. So it’s a question of content which group opens/clicks. Marketers usually have more than enough data to be analyzed. How much time and effort should be spent is hard to say. It can make sense to double-check the differences in open rates versus real conversions – are they reflected, or might something else behind the differences?